When discussing differences between moles and voles it is helpful to understand that there are more than 20 species of mole within the genus Talpidae and that vole is actually the common name for several different genera within the subfamily Microtinae, which also includes a number of other species -- including muskrats, and lemmings. Narrowing down the species most likely to be encountered together within a given range is essential for a meaningful comparison between the insectivore (mole) and the rodent (vole). Gardeners everywhere recognize the mole as an unwelcome guest beneath their prize tomatoes or flowers. Of the six recognized mole species in North America, the culprit most likely responsible for those tunnels cutting off water and nutrients from your plants root systems is the common eastern mole (Scalopus aquaticus) -- though the hairy-tailed mole (Parascalops breweri) and star-nosed mole (Condylura cristata) are relatively common, especially in the eastern United States and parts of Canada. Since voles are related to gerbils, rats, hamsters and mice -- which they resemble -- they are often mistaken for them. 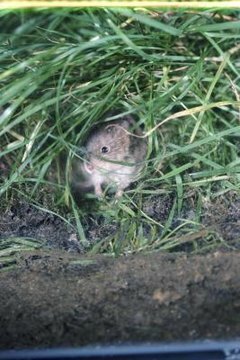 Vole habitat ranges widely according to species, with the meadow vole (Microtus pennsylvanicus), an inhabitant of fields, pastures, prairies and meadows, most commonly misidentified as a field mouse. This little vole is the most common vole in the United States. Both moles and voles are mammals, so they have hair, give live birth to their young and produce milk to feed them. They also are both relatively small animals -- an adult mole ranges from 5 1/2 to 9 inches long while a vole is smaller at only 5 to 7 inches in length, including its relatively stubby tail. Aside from those basic attributes, moles and voles have little in common. Moles are nearly blind because they spend most of their life below ground in extensive tunnel systems that they dig for themselves with their powerful, shovel-like forefeet. They are insectivores and relish a diet of earthworms and other insects they find there. Voles on the other hand live above ground in grassy spaces and have nimble fingers for grasping the seeds and flowers they prefer to eat. They are themselves a favorite prey for predators from birds to foxes, so are most active at night. If you look at a mole and a vole side-by-side, you will see that they are both small but look nothing alike. The mole resembles a soft, furry cylinder with a pointy nose and four flipper-like appendages, while the vole looks a bit like a cross between a fat mouse with a short tail and a pint-sized beaver.